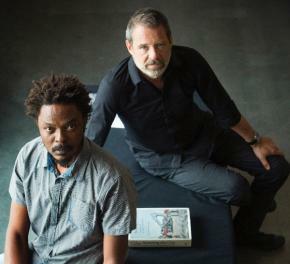 SAMMY BALOJI e FILIP DE BOECK, foto de Dieter TelemansSammy Baloji e Filip De Boeck falarão do seu livro Suturing the City: Living Together in Congo’s Urban Worlds (2016) e da sua exposição Urban Now: City Life in Congo, que estará patente em Lisboa a partir do final de Março (Galeria Av. da Índia). Filip De Boeck (b. 1961, Antuérpia, Bélgica) é Professor de Antropologia no Institute for Anthropological Research in Africa (IARA) da Universidade Católica de Lovaina, Bélgica. As suas publicações incluem Kinshasa: Tales of the Invisible City (2004, com a fotógrafa Marie-Francoise Plissant), e mais recentemente Suturing the City: Living Together in Congo’s Urban Worlds (2016, com Sammy Baloji). De Boeck também realizou Cemetery State (2010), um documentário sobre um cemitério de Kinshasa, e produziu várias exposições. A sua exposição Kinshasa: Imaginary City(2014), co-comissariada com Koen Van Synghel para o pavilhão belga da 9ª Bienal de Arquitectura de Veneza, recebeu um Leão de Ouro. Ana Balona de Oliveira, Pensando a Partir do Sul: Comparando Histórias Pós-Coloniais e Identidades Diaspóricas através de Práticas e Espaços Artísticos, Transnational Perspectives on Contemporary Art: Identities and Representation, CASt-IHA-FCSH-NOVA e Visual Culture, Migration, Globalization and Decolonization, CITCOM-CEC-FLUL. Mónica de Miranda, Post-Archive: Politics of Memory, Place and Identity, CITCOM-CEC-FLUL. Apoio: DG Artes, FCT – Fundação para a Ciência e a Tecnologia, IHA-FCSH-NOVA, CEC-FLUL. Sammy Baloji (b. 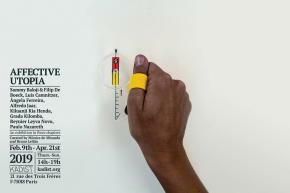 1978 Lubumbashi, Democratic Republic of Congo) is a visual artist based in Brussels and Lubumbashi. He is the co-founder of the Lubumbashi Biennial organized by Picha Asbl. Internationally renowned, Baloji’s work has been exhibited in prestigious venues such as the Musée du Quai Branly, Paris; Muzee, Ostend; the Royal Museum for Central Africa, Tervuren; Museum for African Art, New York; WIELS, Brussels; the Venice Art Biennial, Venice; and Documenta 2017, Kassel and Athens. 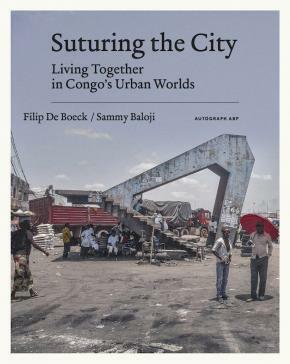 Recent book publications include Mémoire/Kolwezi (2014), Hunting and Collecting (2016), and Suturing the City: Living Together in Congo’s Urban Worlds (2016, with Filip De Boeck). 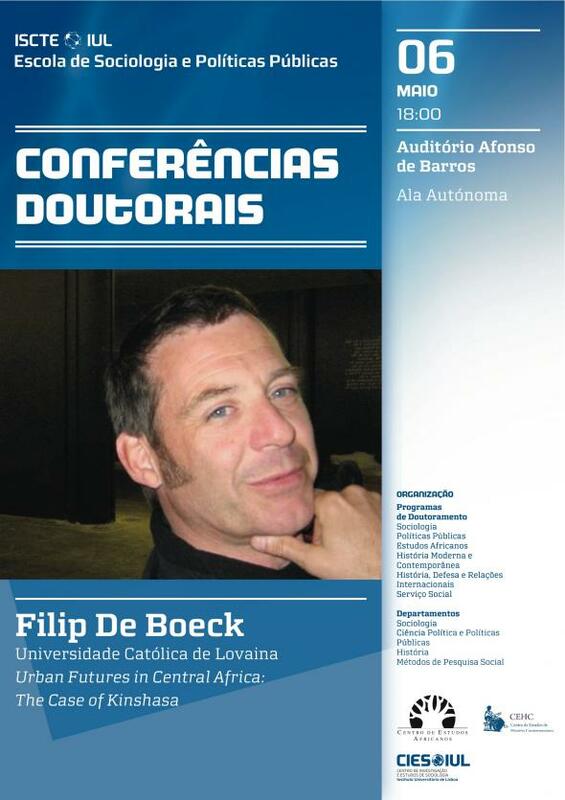 Filip De Boeck (b. 1961, Antwerp, Belgium) is Professor of Anthropology at the Institute for Anthropological Research in Africa (IARA) at the Catholic University of Leuven, Belgium. His book publications include Kinshasa: Tales of the Invisible City (2004, with photographer Marie-Françoise Plissart), and most recently Suturing the City: Living Together in Congo’s Urban Worlds (2016, with Sammy Baloji). De Boeck also directed Cemetery State (2010), a documentary about a Kinshasa graveyard, and produced several exhibitions. His exhibition Kinshasa: Imaginary City (2014), co-curated with Koen Van Synghel for the Belgian Pavillion at the 9th Venice Architecture Biennial, was awarded a Golden Lion. In 2016, De Boeck and Baloji presented the exhibition Urban Now: City Life in Congo at WIELS Contemporary Art Centre, Brussels, in collaboration with the Open Society (New York) and The Power Plant (Toronto). On March 23 2018, the exhibition will open at Galeria Av. da Índia/EGEAC (Lisbon). Ana Balona de Oliveira, Thinking from the South: Comparing Post-Colonial Histories and Diasporic Identities through Artistic Practices and Spaces, Transnational Perspectives on Contemporary Art: Identities and Representation, CASt-IHA-FCSH-NOVA and Visual Culture, Migration, Globalization and Decolonization, CITCOM-CEC-FLUL.